To furnish diverse requirements of our clients in best possible manner we are offering a wide range of UV Systems. These systems are complete with micron bag filter followed by cartridge filter. We use best quality material and advanced technology in manufacturing these rods to meet variegated preferences of our clients. With the thorough knowledge of the varied aspects of the market, we have been able to provide the customers with UV Sterilizer. Developed at par with the industry set guidelines, these sterilizers are widely appreciated in the market. High quality UV lamp with a timer control feature is excellent for sterilizing the instruments before carrying out sensitive or PCR experiments. We are well established manufacturers and exporters of Ultraviolet Sterilizers, which is air, ultraviolet sterilizers for instrument, air sterilization, ozone sterilization and UV sterilizers. Our range is designed in accordance with industry standards and meet the various requirements of our clients. We also offer our range at competitive prices. 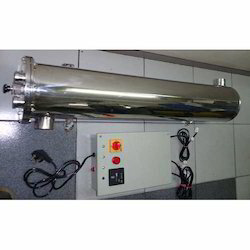 Offering ultraviolet sterilizer for water treatment. We MAXIMUS water & waste water solutions is engaged in design, manufacture, supply and installing Ultraviolet sterilizer as a disinfection equipment along with our water treatment systems or a single unit for various industrial and commercial applications. Purpose: To Disinfect the water.